Through the countless hours spent working with clients and creating presentations, cases come to represent more than just names to the team at DK Global. They reflect the passion of an attorney fighting for justice and fairness, the tragedy of negligence, and hope in the face of suffering. While each case is special to us, certain cases rise above to uniquely engage, inspire, and motivate our team. The Golden Advocate Awards is our way of honoring and recognizing these extraordinary cases. The Trial Touch Success Award is presented to an attorney or firm whose utilization of the iPad app resulted in a remarkable outcome. 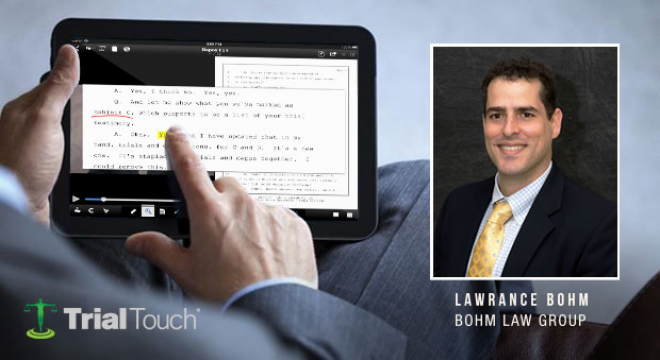 Attorney Lawrance Bohm of the Bohm Law Group masters the art of trial preparation and presentation technology with TrialTouch, DK Global’s app for iPad. Having replaced archaic forms of trial prep and presentation methods long ago, attorney Bohm is an avid user of TrialTouch and stays ahead of the curve by organizing exhibits and documents within the app, and presents his cases in the courtroom right from the palm of his hand. Recently, Bohm delivered a compelling argument using Trial Touch on behalf of a former female AutoZone employee in a pregnancy and gender discrimination case. The jury found in favor of the plaintiff, awarding $872,000 in compensatory damages and an unprecedented $185 million in punitive damages.